Glendale, California- On March 15, 2016 at approximately 8:30pm the, the Glendale Unified School District Board of Education voted to observe April 24th as the “Armenian Genocide Commemoration Day” closing down all 14 schools within the district. 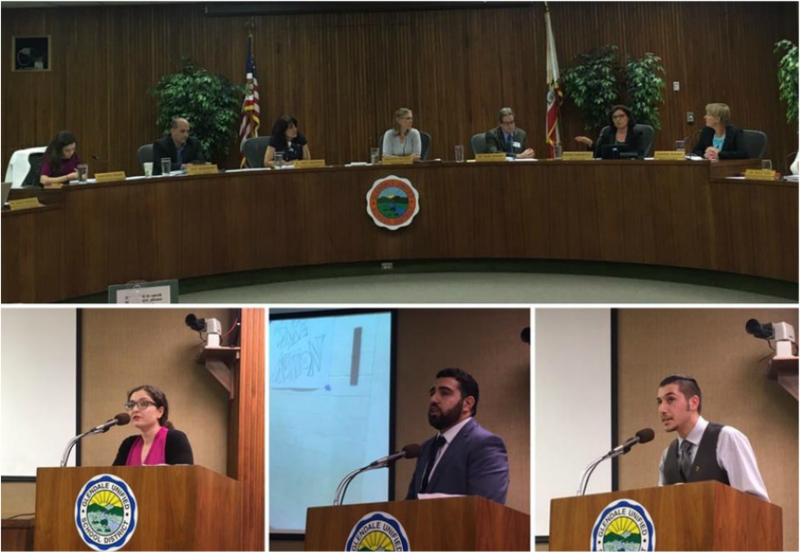 Prior to the board’s vote community organizations, leaders and members one after another took to the podium to speak in support, including ANCA Glendale Chair Zareh Adjemian, Community Outreach Director Gev Iskajyan, and ANCA Western Region Executive Director Elen Asatryan. In his remarks ANCA Glendale Chair Adjemian stated, “Glendale Unified School District’s board of education's resolution passed today approved by Glendale's Teacher Association, California Schools Employees Association’s Glendale Chapter and Glendale Schools Management Association is a historic decision. The resolution which is in response to ANCA Glendale’s initiative and the community’s demands proving that our city's school officials not only honor their constituents, but they also respect the over 1.5 million innocent martyrs of the Armenian Genocide. I strongly believe that this resolution will have a positive impact for our community for generations to come. This is not a victory only for our community but for all of humanity and a step towards to world without genocide,” while Asatryan noted that commemorating the Armenian Genocide in such a manner not only pays tribute to the over 1.5 million lives lost during the Genocide, but also to the American people and all those who risked their lives to travel across seas and help save over 132,000 orphans, 1 million refugees and ultimately the Armenian nation from annihilation. “It is not only important that we remember this day, but we continue the process of education, until the whole world knows about the Armenian Genocide, until we live in a world without one”, stated GUSD Board Member Nayri Nahabetian. The resolution was accumulation of petition drives, online social media campaigns, and the work relentless work of the ANCA-Glendale chapter in making this vision a reality. The measure passed an a unanimous decision, with all 5 Board Members voting in favor of the resolution with board member speaking at length and in favor of the resolution and all of it’s historic implications.